One of my deepest impressions of Fotanian: Fotan Artists Open Studios 2008 earlier this year was a studio on the 16th floor [translator's note: It should have been 18th of the Block B of Wah Luen Industrial Centre], situated beside a roast meat factory. 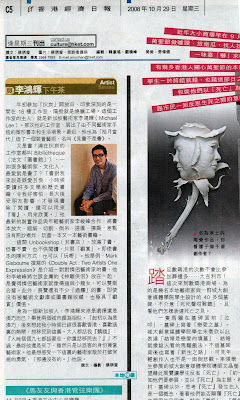 The owner of the studio is Singapore-born artist Michael Lee Hong Hwee. During the open days, the studio exhibited handcrafted miniature books and objects. Recently, in conjunction with October Contemporary 2008, he created an installation entitled The Booked, the Unbooked and the Unbookable. Books again? Even his studio name has the word Bibliothèque (French for library). Are books the the biggest love objects of artists and cultural practitioners? "I have a love-hate relationship with books: When I was young, the burden of humanities subjects like literature and history horrified me. As I grew up, peer influence led me to realise that books are not only for reading; they can also be 'looked at,' to be appreciated." Lee's latest installation is a collaboration with young artist Lee Chun Fung. In it, they did almost everything one can to books: enlarge, minitaurise, cut,... only short of putting them in pots to cook. Their Unbookshop is filled with books, which are not for sale. Neither are they for reading; only for appreciation. The artists explored ways of displaying books instead. For example, they placed Mark Gisborune's book, Double Act: Two Artists One Expression, beside Jin Yong's classic The Return of the Condor Heroes, suggesting that artistic duos' practice are not unlike that of the legendary pugilistic master Xiaolongnu and her disciple Yangguo known for their two-in-one swordplay. There are also many intriguing books; even though there weren't any books from the archive or library, the installation has value in visual appreciation. Is Singaporean Lee's move to Hong Kong a coincidence, given that the two cities are rather similar? "At first I thought it might have been mere chance, but I soon recalled that I had liked Hong Kong very much since young; I even fantasised and shared about my dream of immigrating here, to my adult relatives, who responded uniformly: 'Everyone is leaving Hong Kong because of the 1997 Handover; and you want to immigrate there?" Yet he has come eventually, though this time in the capacity of a tourist working as an artist here. He wishes most to absorb the gung-ho spirit here. "There isn't any back home," Lee added.